The year is 1883, and in New York City, it’s a time of dizzying splendor, crushing poverty, and tremendous change. With the gravity-defying Brooklyn Bridge nearly complete and New York in the grips of anti-vice crusader Anthony Comstock, Anna Savard and her cousin Sophie—both graduates of the Woman’s Medical School—treat the city’s most vulnerable, even if doing so may put everything they’ve strived for in jeopardy. Anna's work has placed her in the path of four children who have lost everything, just as she herself once had. Faced with their helplessness, Anna must make an unexpected choice between holding on to the pain of her past and letting love into her life. For Sophie, an obstetrician and the orphaned daughter of free people of color, helping a desperate young mother forces her to grapple with the oath she took as a doctor—and thrusts her and Anna into the orbit of Anthony Comstock, a dangerous man who considers himself the enemy of everything indecent and of anyone who dares to defy him. 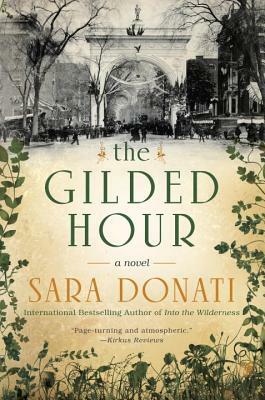 With its vivid depictions of old New York and its enormously appealing characters, The Gilded Hour is a captivating, emotionally gripping novel that proves Sara Donati is an author at the height of her powers. Sara Donati is the international bestselling author of the Wilderness series, which includes Into the Wilderness, The Endless Forest, Queen of Swords, Fire Along the Sky, Lake in the Clouds, and Dawn on a Distant Shore. The Gilded Hour follows the story of the descendants of the characters from the Wilderness series.